This news item was posted in Diabetes, G category and has 1 Comment so far. Diabetes is a lifelong disease for which there is not yet a cure. There are several forms of diabetes. Type 1 diabetes is often called juvenile or insulin-dependent diabetes. In this type of diabetes, cells of the pancreas produce little or no insulin, the hormone that allows sugar (glucose) to enter body cells. In addition, the high levels of glucose in the blood causes increased urination. This leads to excessive thirst. Within 5 – 10 years, the insulin-producing beta cells of the pancreas are completely destroyed and the body can not longer produce insulin. Type 1 diabetes can occur at any age. Many patients, however, are diagnosed after age 20. The exact cause is unknown. Genetics, viruses, and autoimmune problems may play a role. 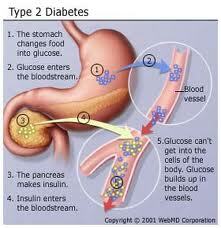 Insulin lowers blood sugar by allowing it to leave the bloodstream and enter cells. Everyone needs insulin. People with type 1 diabetes can’t make their own insulin. They must take insulin every day. The injections are needed, in general, from one to four times a day. People are taught how to give insulin injections by their health care provider or a diabetes nurse educator. At first, a child’s injections may be given by a parent or other adult. By age 14, most children can be expected (but should not be required) to give their own injections. The American Diabetes Association and the American Dietetic Association have information for planning healthy, balanced meals. It can help to talk with a registered dietitian or nutrition counselor. Regular exercise helps control the amount of sugar in the blood. It also helps burn excess calories and fat to achieve a healthy weight. Ask your health care provider before starting any exercise program. Those with Type 1 diabetes must take special precautions before, during, and after intense physical activity or exercise. Ask your doctor or nurse if you have the right footwear. Exercise every day and at the same time of day, if possible. Monitor your blood glucose levels at home before and after exercising. Carry food that contains a fast-acting carbohydrate in case your blood glucose levels get too low during or after exercise. Wear a diabetes identification bracelet and carry a cell phone to use in case of emergency. As you change the intensity or duration of your exercise, you may need to modify your diet or medication to keep your blood glucose levels in an appropriate range. Blood glucose monitoring is done by checking the glucose content of a small drop of blood. The testing is done on a regular basis and will let you know how well diet, medication, and exercise are working together to control diabetes. The results can be used to adjust meals, activity, or medications to keep blood sugar levels within an appropriate range. Tests are usually done before meals and at bedtime. More frequent testing may be needed when you are sick or under stress. Testing will provide valuable information so the health care provider can suggest improvements to your care and treatment. Testing will identify high and low blood sugar levels before serious problems develop. A device called a glucometer can provide an exact blood sugar reading. There are different types of devices. Usually, you prick your finger with a small needle called a lancet to get a tiny drop of blood. You place the blood on a test strip and put the strip into the device. You should have results within 30 – 45 seconds. Keeping accurate records of your test results will help you and your health care provider plan how to best control your diabetes. Diabetes causes damage to the blood vessels and nerves. This can reduce your ability to feel injury to or pressure on the foot. You may not notice a foot injury until severe infection develops. Diabetes also affects the body’s immune system, decreasing the ability to fight infection. Small infections can rapidly progress to death of the skin and other tissues. Amputation may be needed. To prevent injury to the feet, get into a routine of checking and caring for your feet daily. See: Diabetes foot care. If these symptoms occur and you have a blood sugar test kit available, do a blood sugar check. If the level is low, eat something with sugar: fruit juice, several teaspoons of sugar, a cup of skim milk, or regular soda. If you don’t have a test kit handy, eat sugar anyway – it can’t hurt. Symptoms should go away within 15 minutes. If the symptoms don’t go away, eat more sugar and test the sugar level again. AFTER the symptoms go away, you can eat more substantial food. Eat simple sugar first to get the situation under control. Even if you or your child is hungry, do not eat “real” food until the sugar level comes up. Real food won’t produce enough sugar and takes too long to digest. If you are a parent, relative, or friend of someone experiencing these symptoms, monitor the person closely. If symptoms become worse (confusion, seizures, or unconsciousness) give the person a shot of glucagon. If you don’t have glucagon, call 911 immediately. You should have some glucagon stored for emergencies. Make sure everyone in your home, as well as babysitters and caregivers, knows how to use it. Also check the expiration date. Don’t panic. Glucagon works very fast — usually within 15 minutes. Lay the person on the side to prevent choking. If the person is not better in 15 minutes, call 911. When there is not enough insulin to move glucose into cells, glucose can build up in the blood. The body then looks for other forms of energy and uses fat as a fuel source. As fats are broken down, acids called ketones build up in the blood and urine. In high levels, ketones are poisonous. This condition is known as ketoacidosis. You are the most important person in managing your diabetes. Diabetes education involves learning how to live with your diabetes. It helps prevent complications. The outcome for people with diabetes varies. Studies show that tight control of blood glucose can prevent or delay complications to the eyes, kidneys, and nervous system. However, complications may occur even in those with good diabetes control.